Luxuriously modern and stylishly nautical, the all suite Crystal Espirit enchants with the promise of customized discovery in yachting destinations from the Dalmatian Coast and Greek Isles to the Seychelles and West Indies. A staff of 90 caters to just 62 guests in 31 butler serviced suites. She is much like a private club with a relaxed and unregimented ambience. Itineraries ashore complement the yachting experience, often island or port hopping to multiple locations in a single day or remaining at anchor in harbours by night. 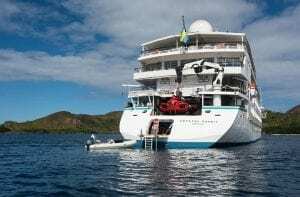 All inclusive amenities and services enhances the easy elegance aboard Crystal Espirit from unlimited fine wines and spirits, all gratuities shipboard and shoreside to unlimited Wi-Fi and open invitation to jump in and swim, snorkel, kayak and more from the yacht’s marina platform.